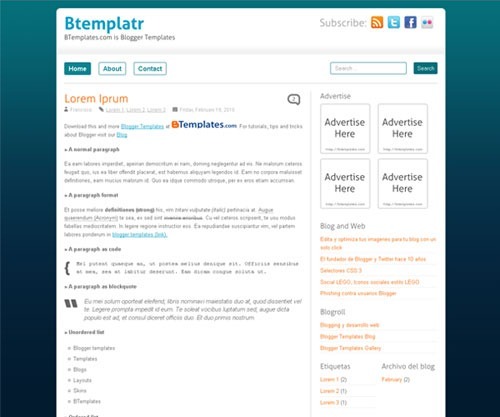 BTemplatr is a blogger template designed by Blog and Web and BTemplates exclusively for Blogger users. 6 areas for gadgets / widgets. Social Bookmarks on individual pages. Short URL’s (bit.ly) on individual pages. Color Settings from the panel. Replace "username" with your own user name on each service. To add links to the menu, simply create a new static page from the Dashboard. To use them, replace the image url and the url destination of each banner. To remove, simply delete all the code within <!-Ads -> and <! - / Ads ->. Licensed under Creative Commons. Permitted use on personal or commercial web sites, not derivative works, attribution to the author (Not remove or add links on the credits). i want to remove the full advertisement section.pls help me by giving the detailed process for it.i am new. Your template very exellent! I like all. Mr, May i add your template to my blog for every one can download your template? and your banner i save in my blog and i add your link information. I am testing your template and it seems to be very good. I made some small modifications and I created few subpages etc. Everything is fine but I have those annoying pencil&body ficure icons in every subpage under the topic. Do you have any tips how to edit those away, from subpages only? I can see you have the same problem in the demo also. Those are pretty ugly. Thanks for the template. I think i will incorporate it into my site! ive been using this theme, but my post is broken in random. the error said that CUFON is not defined. Nhoel, download the template again, we update this template recently.